Coral Reef Restaurant is a tucked-away gem of a dining experience in Epcot’s Future World. Its entrance is just around the corner from the entrance to The Seas with Nemo and Friends Pavilion, but you might miss it if you are not looking for it! 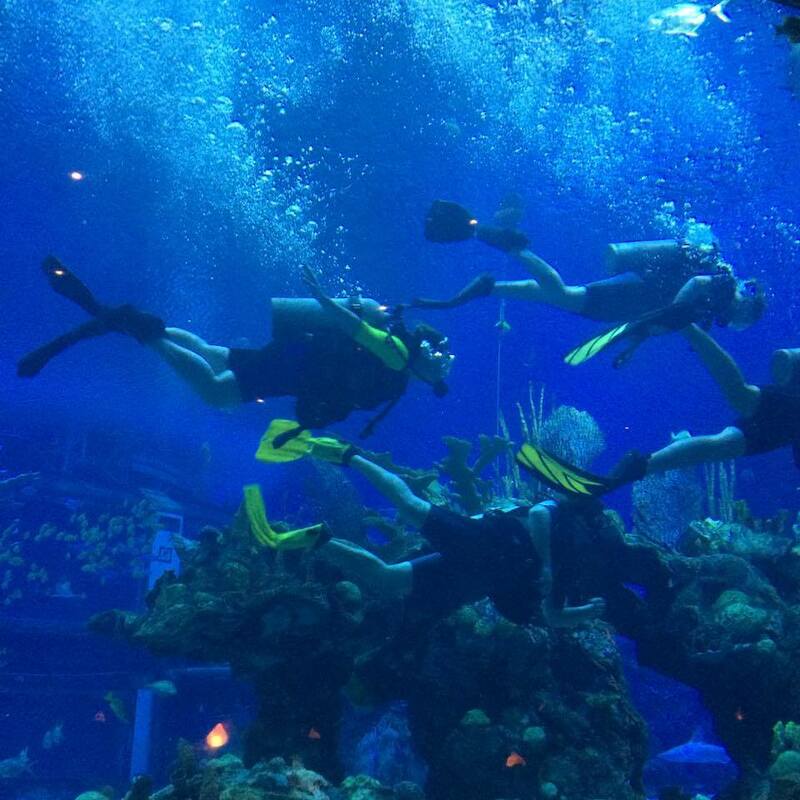 Once inside, guests are greeted by a hostess in the reception area decorated in ocean blues, but the real feature of Coral Reef Restaurant – the massive aquarium – is hidden further inside the restaurant, allowing for lots of “oohs” and “ahhs” when being seated. 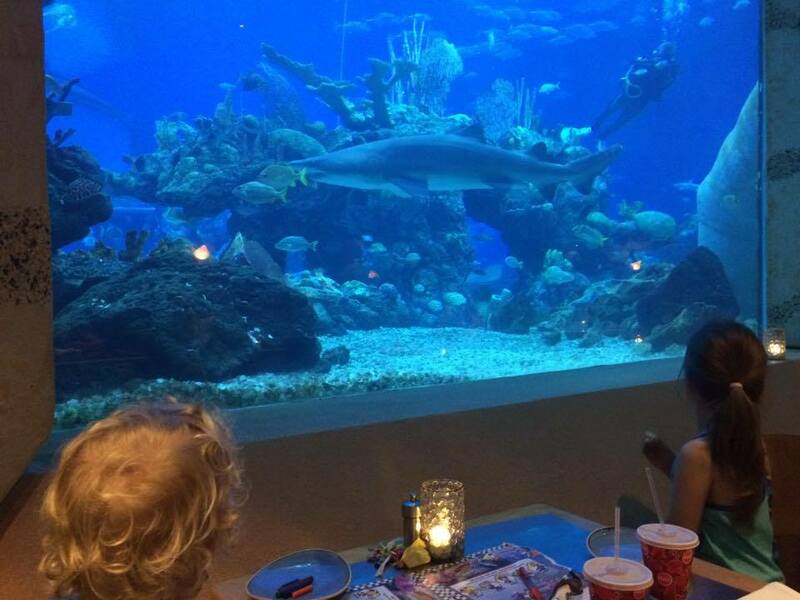 The seating at Coral Reef is auditorium-style, meaning the tables and chairs are arranged on different levels from the lowest near the tank glass to higher up the further back you go in the restaurant, so that all guests have an opportunity to see the “show.” That show includes many species of fish and marine life, including large sea turtles, stingrays, sharks – and even the occasional scuba diver – swimming by throughout dinner. 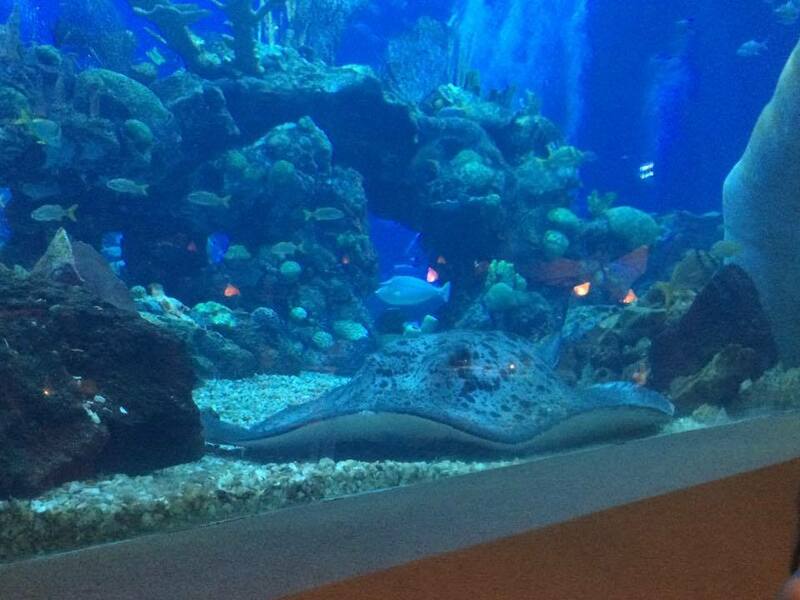 One stingray even settled down for an evening nap right by our window! The kids (and kids at heart) loved the view! possible. I was told that most of those tables would require a long wait, but the hostess would do his best. And did he ever! 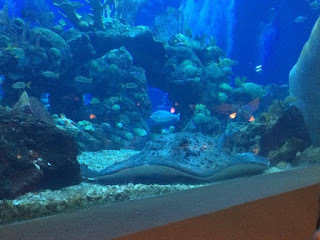 We waited a little past our reservation time, but the result was worth it – we were given a table right next to the tank, which thrilled my two- and six-year-olds (as well as my husband and me!). While requests are never guaranteed, it does not hurt to request a table near the tanks when you check in for your reservation. However, the views from locations throughout the restaurant were equally mesmerizing – we would have been happy anywhere, I believe! Our server stopped by to take our drink order, and brought a basket of bread to the table. We were on the Disney Dining Plan, so she explained that each of us (with the exception of my two-year-old) would be able to order one non-alcoholic drink, one entrée and one dessert, that would be covered by the dining plan. I also decided to order the red sangria, which I paid for out of pocket. When it was time to place our food order, my husband and I both chose the Grilled New York Strip Steak, and my daughter ordered the kids’ version of the same, the Jr. Reef Steak. While we waited for our food, we were “entertained” by the variety of marine life that seemed close enough to touch. Children and adults throughout the restaurant were equally intrigued by this dining experience. At one point, participants in the DiveQuest scuba diving adventure swam past as we watched, waving to everyone in the restaurant. It was a great way to pass the time waiting for our meal. The food was really delicious. 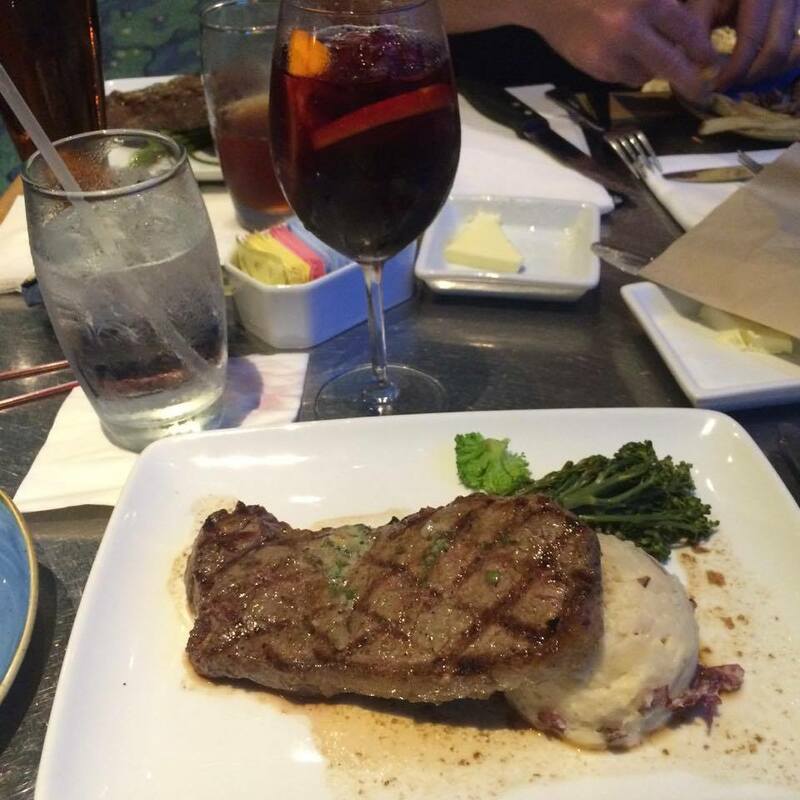 My husband and I love a good steak, and this one did not disappoint. It was cooked well (mine medium well, his medium), and the butter made it very moist. The sides of mashed potatoes and seasonal vegetables (broccolini) were also very good. Finally, it was time to order my favorite part of any meal – dessert! Coral Reef features several good dessert options. I chose the Turtle Cheesecake with Caramel while my husband ordered the Baileys and Jack Daniel's Mousse. Both were equally delicious – we “dove” right in! My daughter ordered a cupcake, and both her entrée and dessert were enough to share with our two-year-old, who still does not eat much for dinner. By the time our dinner at Coral Reef was over, we all agreed it was one of our favorite dining experiences at Disney World. I can’t wait to go back to enjoy the steak, dessert and dining companions! Love the atmosphere at Coral Reef!